Disclosure: I got this product as part of an advertorial. I received a gift card to pay for a portion of our meal in exchange for my honest review. We went to the Bonefish Grill on a very busy night. Although we had made internet reservations, we still had to wait about 20 minutes. My two kids were restless and the staff was great in helping us out. After my daughter wanted a peppermint, one of the hosts even offered us one of his own mints that he'd brought from home! The food was delicious and my 2-year-old daughter even ordered and ate fish! I'd say that is a huge success. Read on to see pictures of our meals and to hear more about our experience. Currently, Bonefish Grill is celebrating lobsters with a special lobster menu. 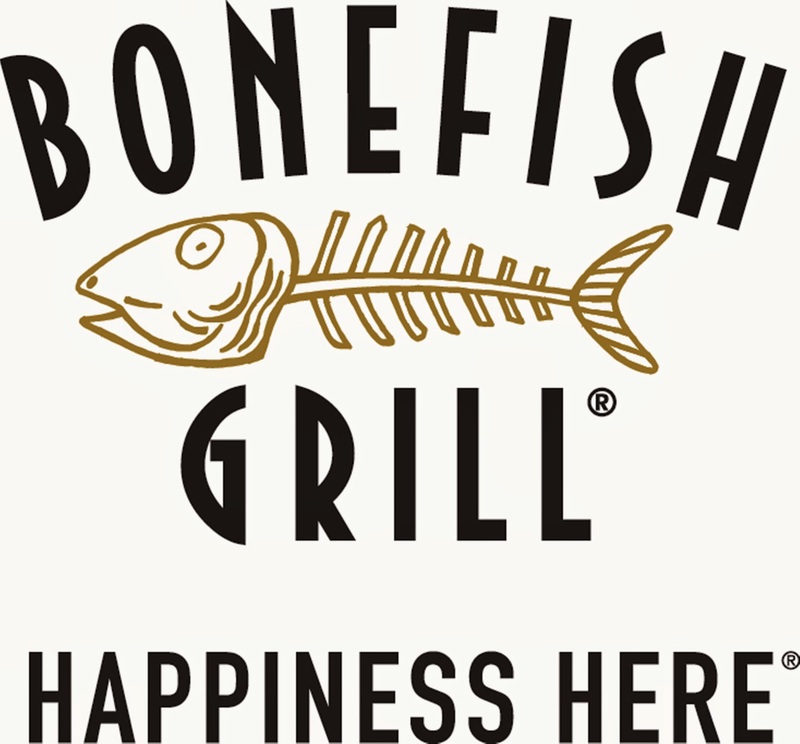 Bonefish Grill also has menus for holidays such as Valentine's Day, as well as their special menu items for Sunday Brunch, Coldwater Catch, Lunch, and Triple Bang. You can read more here about their special menus. I'm happy to report that Bonefish Grill is a proud sponsor of Ocean Trust. We were very hungry and we ordered an appetizer and the kids' meals right away. Our waitress was great and brought the kids' food out right away, which we always appreciate. 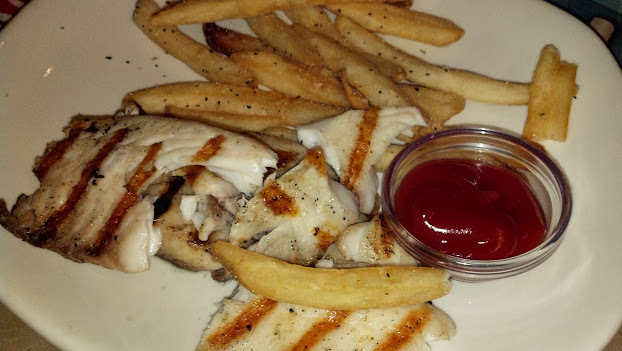 Our daughter (2) ordered grilled fish with french fries and our son (5) ordered cheesy pasta with fries. (That's what he gets no matter where we go!) As you can see, it's not just some boxed macaroni and cheese. This is the real deal. We weren't able to get a picture of my daughter's plate before she dug in, which is a testament to how kid-friendly and delicious this fish was. She proclaimed, "I love it!" when she took her first bite. Also, their fries were really good. I'd say that the Bonefish Grill really has their kids' menu figured out. For the adults, we ordered the Wagyu Beef & Ginger Dumplings for our appetizer. Dumplings, gyoza, pot-stickers, (whatever you want to call them) are usually a hit with the whole family. Luckily, the kids already had their food, so we got these all to ourselves. Now, I'm not normally a spicy food fan and these had a bot of a zing to them because they were pan-seared with crispy shallots, Thai peppers and soy sauce. My husband was delighted! And I learned to avoid the Thai peppers. 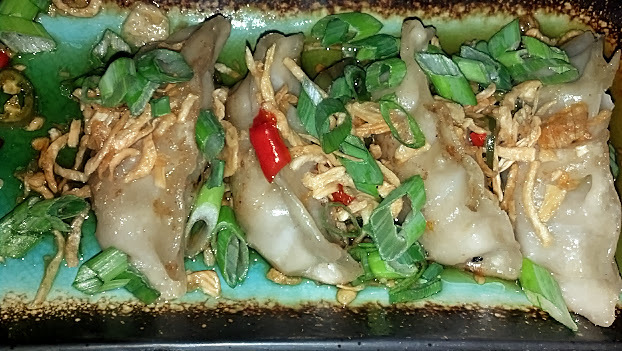 My mouth is watering just thinking about these tender dumplings! 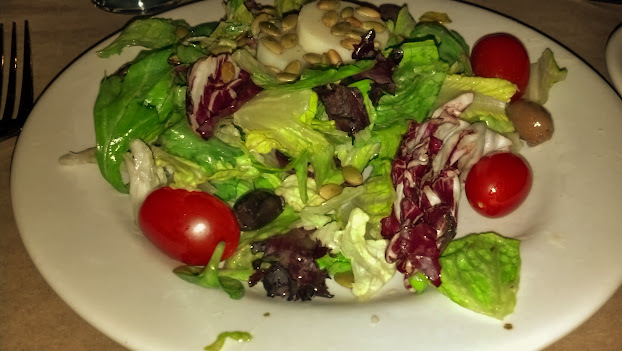 I ordered my entree with a salad, which came with a very light house vinaigrette dressing. I'm a vinegar fan, so I would have preferred a dressing with a bit more bite to it. Aside from my need for more vinegar, I found the salad fresh and crisp. It included tomatoes, Greek olives, and sunflower seeds. It was the perfect size to accompany a meal. 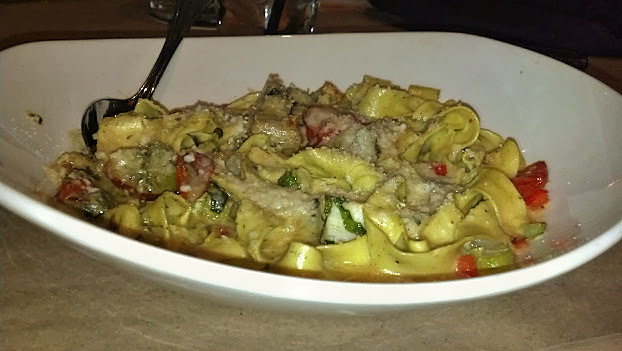 For the main course, I ordered the Artichoke Fettuccine. The dish was beautiful, which does not show up well in this photo. The noodles were cooked perfectly and the vegetables were tender and flavorful. I did wish, at the time, the sauce were slightly creamier, but that's just because I was expecting the "typical" Alfredo Sauce. I actually think that the sauce was a great accompaniment to the flavor of the artichokes, and that most people would enjoy the lighter sauce. 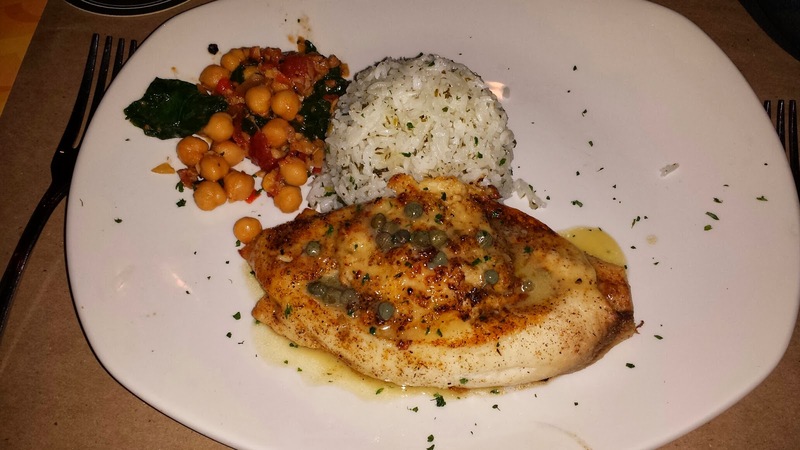 My husband ordered the Tilapia Imperial, which is described as "Royal delicacy pan-seared, baked and stuffed with shrimp, scallops, crab meat and lemon caper butter." It also came with a garbanzo bean salad, which he loved. He was able to choose his own side dish: rice. He says that the fish was great, with good texture and flavor. It was fun to enjoy the fish and then the shrimp-scallop-crab stuffing inside was a real treat. 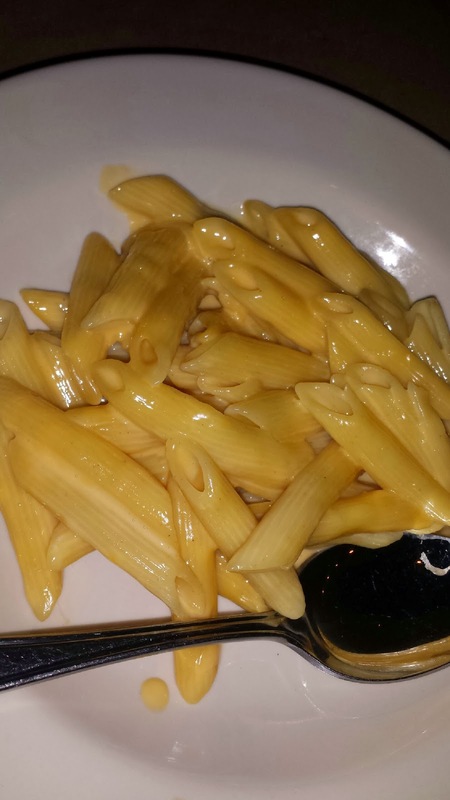 The portions at Bonefish Grill were wonderful and we had a little extra food to take home. I really appreciated that their take out bags were made from 100% recycled paper. We'll be heading to the Bonefish Grill the next time we want a nice seafood dinner!